A defiant President Recep Tayyip Erdoğan on Sunday (16 July) stepped up his attack on the European Union, saying Turkey had to go its own way and vowing to bring back the death penalty if parliament passes it. Erdoğan, who was at the opening ceremony for a memorial dedicated to the roughly 250 people who died during last year’s failed coup, accused Brussels of “messing about” with Turkey’s decades-long bid to join the bloc. 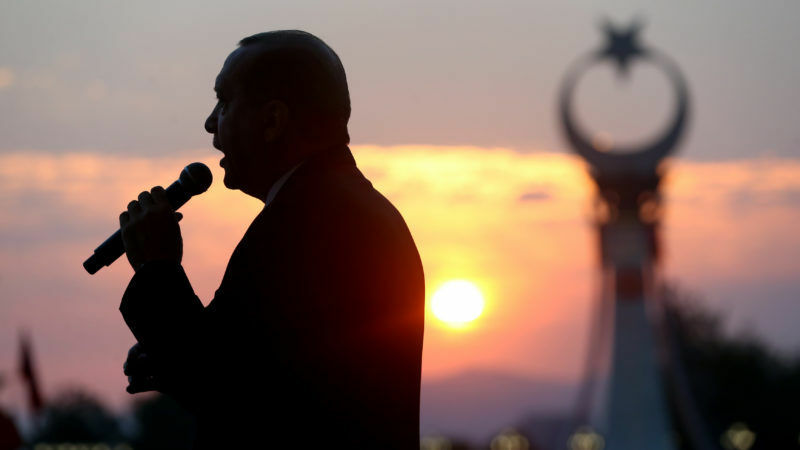 The speech, in front of the presidential palace in Ankara in the early hours of Sunday, wound up a marathon session of public appearances by Erdoğan in both the capital and Istanbul to mark the anniversary of last year’s failed coup. “The stance of the European Union is clear to see… 54 years have passed and they are still messing us about,” he said, citing what he said was Brussels’ failure to keep promises on everything from a visa deal to aid for Syrian migrants. Ties with Europe were strained after the coup, given the West’s alarm about the scale of the government crackdown that followed. Some 150,000 people have been sacked or suspended from their jobs and more than 50,000 detained on suspicion of links to the U.S.-based Muslim cleric Fethullah Gülen, whom Ankara blames for the attempted putsch. He also said he would approve, “without hesitation” the death penalty, if parliament voted to bring it back — a move that would effectively end Turkey’s bid to join the European Union. Erdoğan, the most popular and divisive politician in recent Turkish history, sees himself as the liberator of pious millions who were deprived for decades of their rights and welfare by Turkey’s secular elite. Addressing a crowd of hundreds of thousands in Istanbul on Saturday evening, Erdoğan promised violent retribution against Turkey’s enemies, including FETÖ – his term for Gülen’s network, meaning Gülenist Terror Organisation (Fethullahçı Terör Örgütü) – and the outlawed Kurdistan Workers Party (PKK). Gülen’s network calls itself Hizmet (the service). Erdoğan vows to chop off the heads of those opposing him, calling them "traitors"
He also said that alleged members of Gülen’s network would be forced to wear jumpsuits like those worn by prisoners at the Guantanamo Bay detention camp, after one detainee showed up to a court hearing wearing a T-shirt that said “Hero”. Yeah Dictato Erdogan now sentence you’re own people who are not inline with your poltical idea to death. I hope Mr Juncker has understand that there are a lot of such different mentality in Turkey and shall not ever think to be accessed to the E.U. Everything is different overthere and incompatible to western values . Turkey has already slammed the door Mr Juncker ! “‘Rip the heads off’” is an terroristic ISIS behavior like most fanatical of such Religion . Don’t believe People in Europe will in any way accept even an eccession on the next millenium.